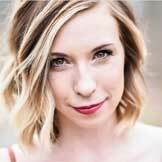 Originally from Dundee, Michigan, Tiffany attended Columbia Chicago College, where she received her Bachelor of Arts in Dance Teaching and Public Relations. After graduation, she received an internship with Thodos Dance Chicago and made her professional debut performance at the Harris Theater in “A Light In The Dark” choreographed by Ann Reinking and Melissa Thodos. After her experience working with Reinking, Tiffany realized her passion for musical theater. Her regional credits include On The Town (Marriott Theater), West Side Story (Paramount Theater), and Wonderful Town (Goodman Theater) where she became a member of the Actor’s Equity Association. As for commercial work, Tiffany was a featured dancer in the Indian Bollywood film Dhoom 3, and has performed with global brands, such as T Mobile and McDonalds. Throughout her training experience, she was fortunate to attend many remarkable programs with Hubbard Street Dance Company, River North Dance Chicago, The Joffrey Ballet, Alvin Ailey Dance Theater, and American Ballet Theater. She has received many awards and scholarships from various dance conventions and toured as an assistant with LA Dance Magic Convention at the age of 17. Along with being an active performer, Tiffany has been noted as an up and coming choreographer of the Chicago area. She was nominated twice as a featured artist for InAside Dance Chicago’s Choreographic Sponsorship Event, where she presented her works “Embrace Against Time” (2014) and “Those Left Behind” (2015). Last year, she was chosen as the Featured Bravo Choreographer for the Dancewerks National Werkshop, where she presented her work “Read Between the Lines.” Tiffany has choreographed many award-winning pieces within the competitive dance scene. As a performer, choreographer, and instructor, Tiffany is driven to craft, mentor, and inspire the next generation of dancers with the knowledge that she has gained throughout her diverse dance career and help them lead a healthy and enthusiastic passion for dance artistry.